Mediterranean-inspired concepts are coming back in terms of fashion and design, and a lot of people seems to like it as it showcase a different era and depth. These homes are inspired with earth tones and are usually used for the cabinets, drawers, and maybe some exposed beams; old-school brass pendants and huge windows. If you want to consider creating a kitchen design that would really stand out, Mediterranean kitchen-inspired space may be just for you! 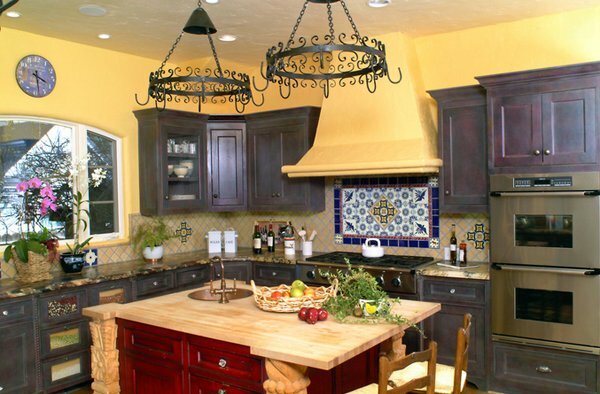 Tons of elements go into Mediterranean kitchen, but that does not mean it is complicated. The best thing about the design is its diversity. Since there are so many themes and cultures involved, you have a wide variety of design options. You can go for bright colors or muted, making life or relax, or make your kitchen as small or large as you want. It’s really just about your creativity and your budget that limits you. 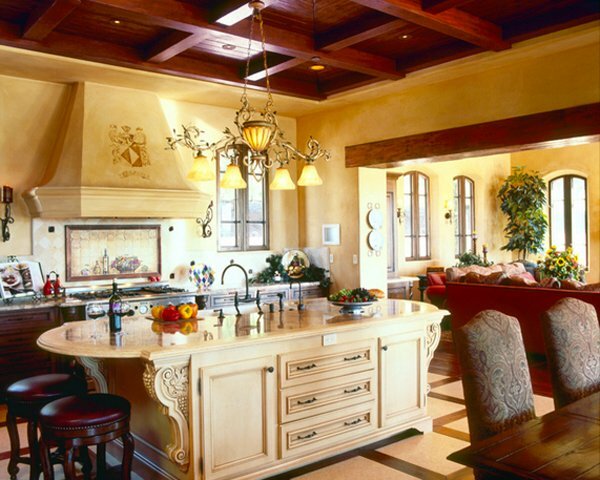 But check the 15 Stunning Mediterranean Kitchens Designs for inspiration and tips to get you started. This flooring, a Mediterranean signature, lends an earthy note and fits in with the warm palette. Brick can work nicely also. If tile feels too cold or hard underfoot, consider bringing in a durable rug that complements the color scheme, perhaps with a swirly design that echoes the curving elements of the space. 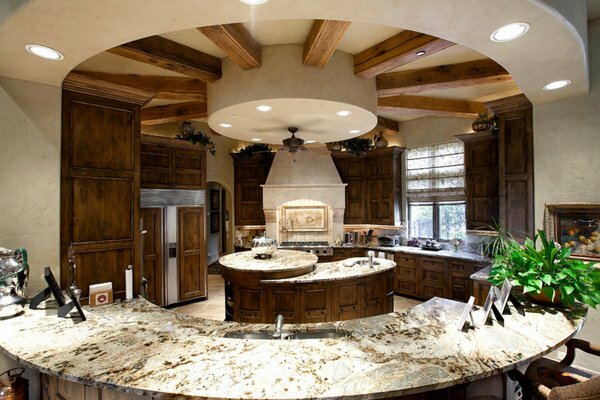 Circular breakfast nook and island which is accentuated with a circular protruding ceiling – this is one interesting and attention-grabbing Dallas kitchen. 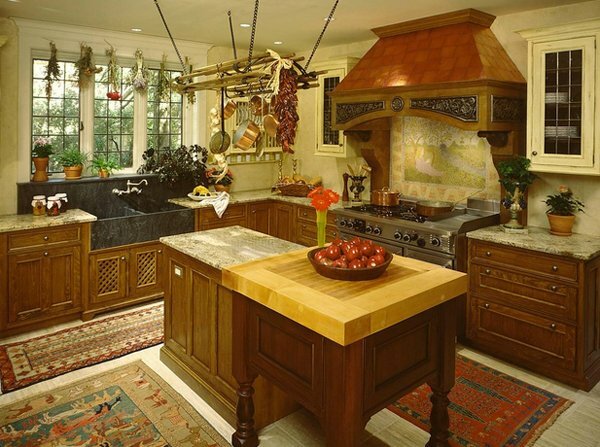 This Tudor Style kitchen and butler’s pantry was done in a designer show house in 1999 in Morristown NJ “The Mansion in May”. The house was sold, the kitchen stayed and the owners loved it. 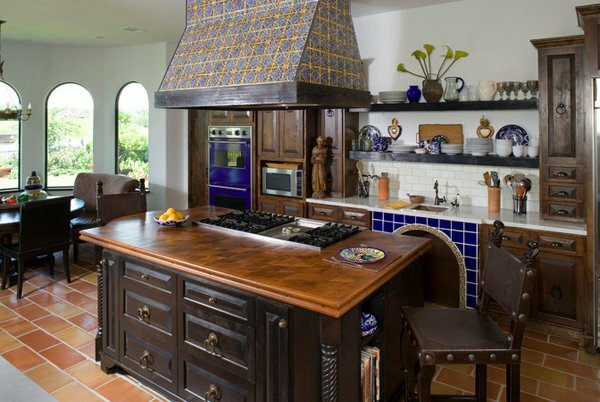 Flared hoods, hand-painted tile, warm wood cabinets, beamed ceilings and arched cooking alcoves are just some of the features that put Spanish revival kitchens on the most-wanted list. 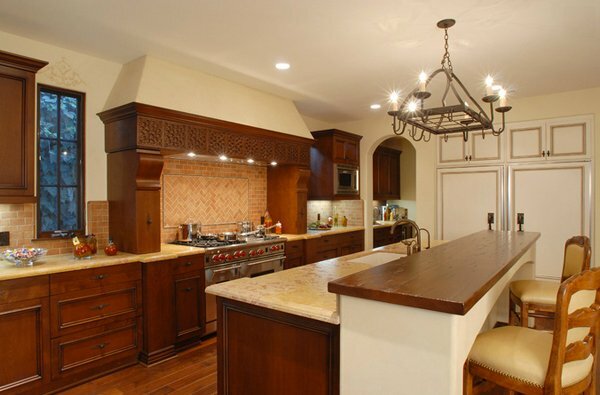 Mesh doors for your cabinets are a good touch when aiming for a Mediterranean or rustic-feel kitchen space. We love how the Brighton Pavilion Mini Pendant lights created drama in this space. Unique shape for a kitchen bar which has a color that contrasts with the dark chocolate brown cabinets. 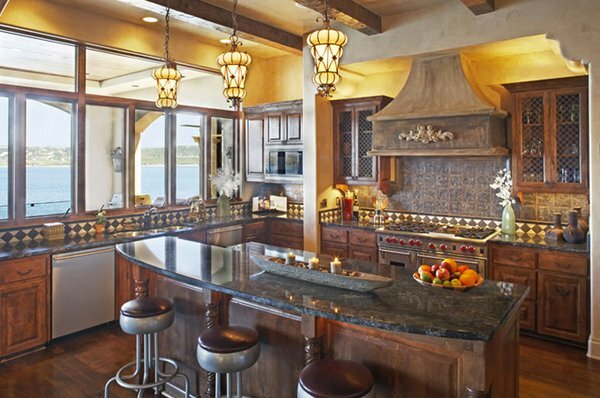 The Mediterranean-inspired pendant lights complement well with the kitchen area. 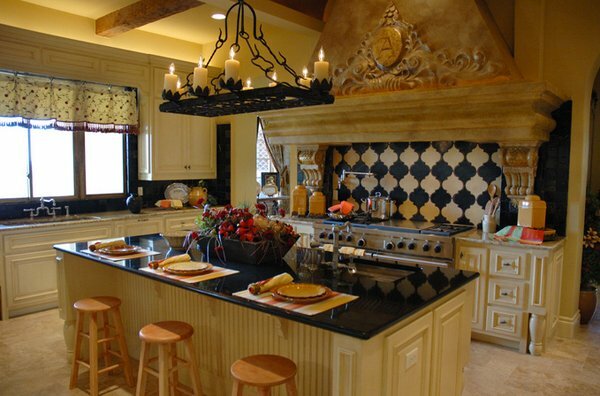 We see a pretty lighting fixture that is above the lovely kitchen island we see in this kitchen. Debra Kay George did a great job with the color palette she used for this space. 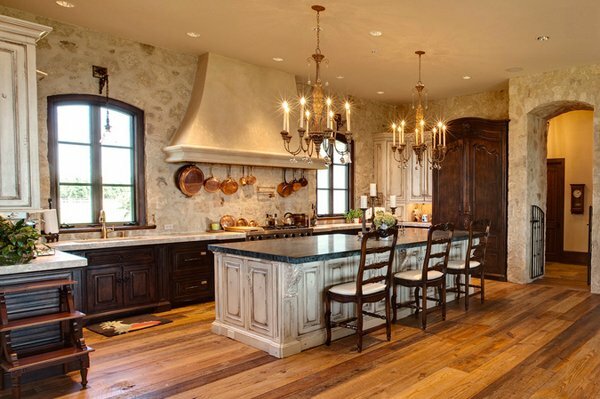 This Austin kitchen boasts a lovely interior. Great job on the family crest engraved on the range hood which is designed with a stunning backsplash behind it. Did we mention we loved the lighting fixture too? The design of this Phoenix kitchen has a bit of a contemporary touch to it. The selection of color is not too fancy but really eye-catching. Even the way the pendants were placed not level to the one beside it is one good move. 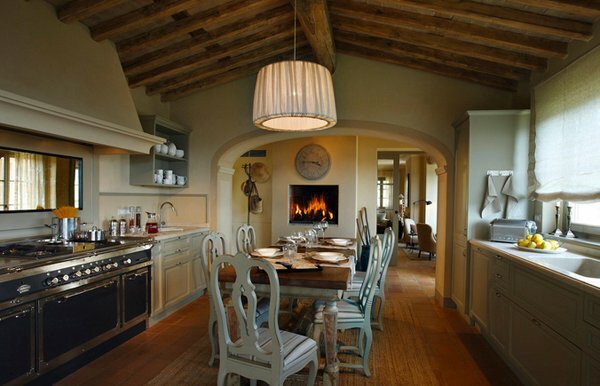 This Southern Tuscan home has a custom-made range which is actually beautiful. It matches well with the white-colored counters and cabinets. The eat-in set we see here is definitely a good vintage find! The colors of the dark wood, cream granite, white trim in this Los Angeles kitchen is something we’d love to have in our homes! Very traditional and surely homey! 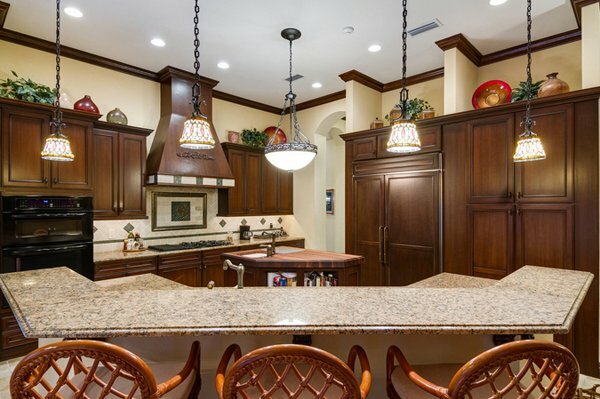 Tuscan style featuring a private court yard, extravagant kitchen, custom ceilings and cabinetry. We think everything about this room is amazing. 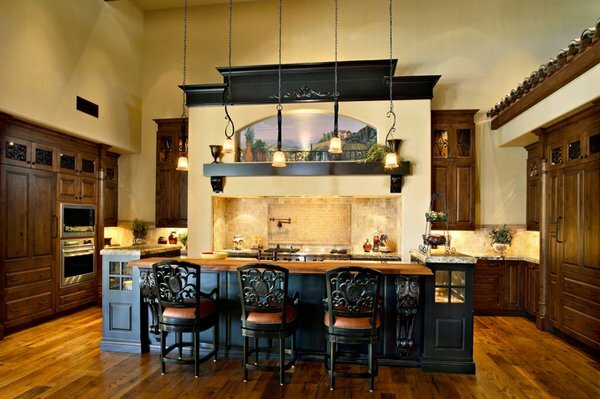 The rustic stone walls and limestone vent hood contrasts perfectly with the elegant chandeliers and detailed cabinetry. This is one of the most beautiful kitchens we’ve seen in a while. 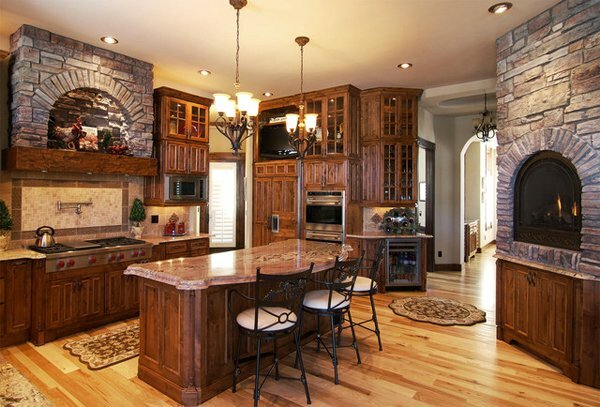 The eroded textures and earthy colors of Coronado Stone Products Weathered Edge stone veneer highlight all the unique surfaces that tie this space together. Various elements can go into Mediterranean kitchen, but that does not mean it will be complicated. In fact, the best thing about the design is its diversity; since there are so many themes and cultures involved, you have a wide variety of design options. 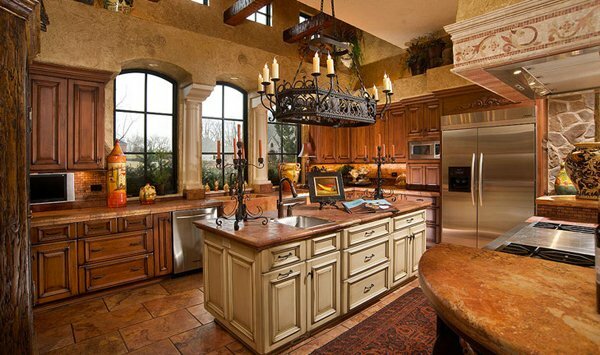 In Mediterranean homes, the kitchen are always the central focal point – so if we were you, focus more on the kitchen. 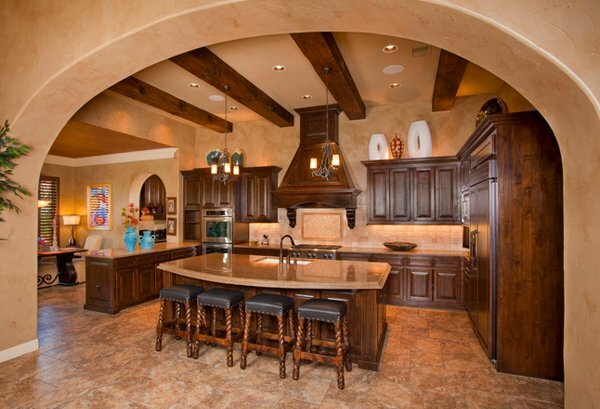 We think that the 15 Stunning Mediterranean Kitchens Designs will definitely help you with that. Remember what to put center stage – wood or stone counters; and if possible, get tons of clay and ceramic bowls and plates – more point if you pick out hand-painted items! And don’t forget to accessorize – even if it’s just a pot rack or wall painting – just like the 15 Interesting Rustic Kitchen Designs which is a bit similar to the list we showed today! Have fun!